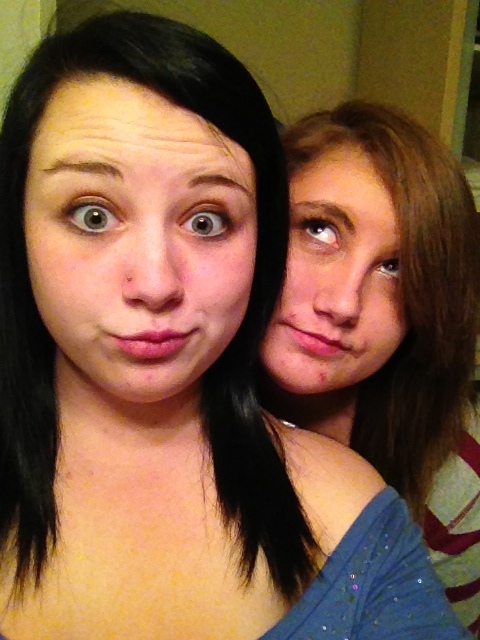 She is amazing, my BFF. I’ve always said so. To be truthful, I’ve often also said that she is crazy, particularly around the time she decided to take in three special needs foster kids, whom she later adopted. All as a single parent. And then a very nice man fell in love with her and married her. They have raised those three kids together for almost two decades. He qualifies as amazing in my book, too. But that’s another story. 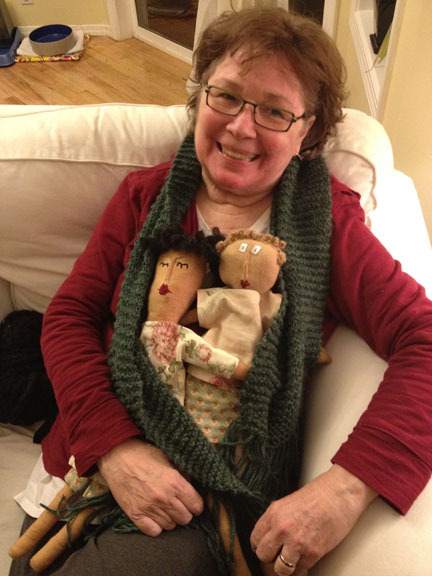 My BFF with the scarf and dolls she made for me. 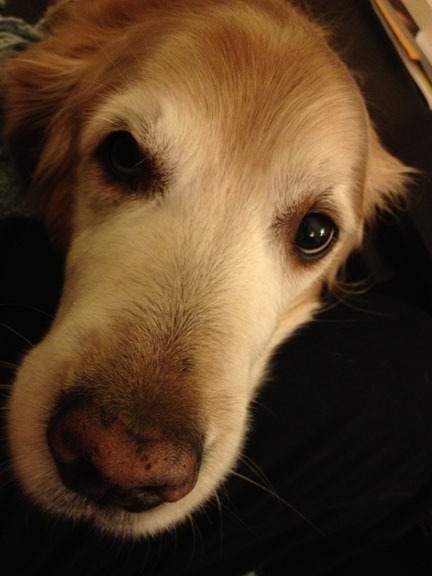 She’s amazing at the moment because she has been living with cancer for four years, and it makes her very sick. But she rises like a phoenix out of the flames, battling great pain, and she does incredible things. Before my visit this week, she cooked for two days–pot roast and soups and stroganoff. And then we spent the first two days together with her daughters, busily doing stuff. Then she had to rest. But so did the Lord after six days of creation. It’s understandable. Then she rose, flapping those phoenix wings, yesterday at 5 a.m. to catch a 6:40 a.m. ferry to the Big City across the water for a day at the Seattle Cancer Center Alliance. I went with her (see my previous post, “I could learn to sleep on ferries”), and we had a lovely, though tiring, day that ended with the BFF getting an A+ on her CT scan. Which means that there are no new tumors and the ones that are there aren’t getting any bigger. Which in the world of living with cancer as a chronic disease is a super-duper, ace of a report card. While in Seattle, we also did two things we really enjoy: ate good food and cruised a good bookstore. The food was breakfast at the Skillet Diner where (I am not making this up) I had scrambled eggs with bell pepper and onion and (hang on) fried chicken. And it was GOOD, as was the BFF’s pancake sandwich with an egg over medium in it. Also spicy potatoes with onion. We decided we could live at the Skillet Diner. Or maybe we’ll tag along after the truck that moves around the city like a couple of panting dogs. We also hung out in the new (to me, anyway) Elliott Bay Books, which, when I was last there, was (hello!) by Elliott Bay. It is now up on 10th Avenue, which makes it harder for tourists like me to find, on a not very snazzy block in what looks to be an old warehouse, but oh, it’s nice inside–very roomy and a poetry section that is three stacks wide. I love me a deep poetry section. 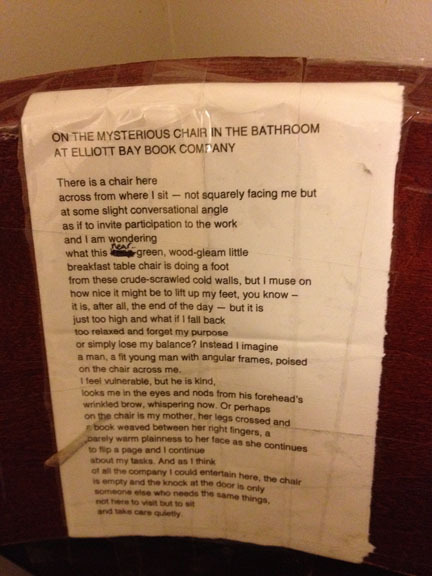 It is also the only bookstore I’ve ever seen where someone has taped a typed poem to the back of a chair in the bathroom. You can sit or stand and read the poem, as I did. We shopped and bought and then sat in the E.B. cafe and drank tea. Just like old times when we used to cruise a bookstore after having dinner together in Sacramento. We went back to the cancer center for a doctor’s appointment and a shot that helps keep those tumors at bay, and then we caught the ferry home. Also over the past several days she has knitted me a new scarf the color of the forest on the island where she lives. 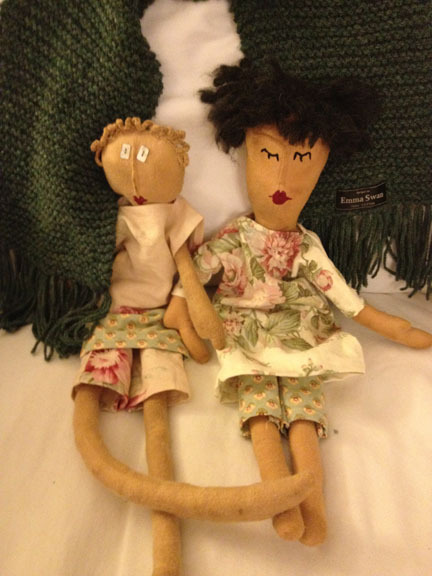 She is sending me home with two new dolls she made. One has frizzy black hair that sticks out from her head like Roseanne Roseannadanna. (Thank you, Gilda!) On my last night in her house, she made apple upside down cake, and though I try to avoid sugar, I had some because, well, the BFF made it. It was, not surprisingly, wonderful. I will eat anything that woman puts on a plate. Though she has been very sick since July, the BFF has had more of her poetry and nonfiction published in the last year than most writers I know. She has held writing groups and encouraged people who never thought they had anything to say to write it down and read it aloud. More than one person has told her that she has saved a life by helping writers find their voices. While I have been on her island, she has lent me her big dog Sam for a lovely walk on the beach and two gorgeous daughters who call me Auntie Jan. She is sending me home today with good books and, always, her undying love. Which is really the best anyone could ask for. Thank you, BFF, for a wonderful visit. You are my hero for so many reasons. Right now it’s the apple upside down cake. Or maybe the scarf. Or the talk story time. Or maybe all of it. Take your pick. Hi Jan, these posts are wonderful tributes to BFF and to ever enduring and expanding love. Thanks for posting them. Jan, a lovely piece, and great photographs. This woman inspires me. And I’m in love with Sam. Your BBF sounds like an awesome person! Thanks for sharing.